The George is the sole bike-able connector between North Jersey and NYC. Its paths are already dangerously overcrowded at 3700 cyclists per day, on weekends, and growing 10.4% per year between 2010 and 2015. If the paths aren’t widened to comply with national standards for a high use cycling facility (AASHTO), the George will become a solely pedestrian facility. This will hobble the growth of cycling across the region for generations, impacting durable enhancements to tourism, public health, affordability, competitiveness, sustainability and resilience annually worth hundreds of millions of dollars. Current Current GWB. (1) 7′ path for pedestrians, runners and cyclists. Photo by Hassan Diop. For six months in 2015, NYC DOT recorded that the GWB averaged 3700 trips per day on weekends, making it the #3 most heavily biked bridge in NYC. Also, the fastest growing at 10.4% per year between 2010 and 2015. Yet at 7 foot wide, the George has by far the narrowest path. 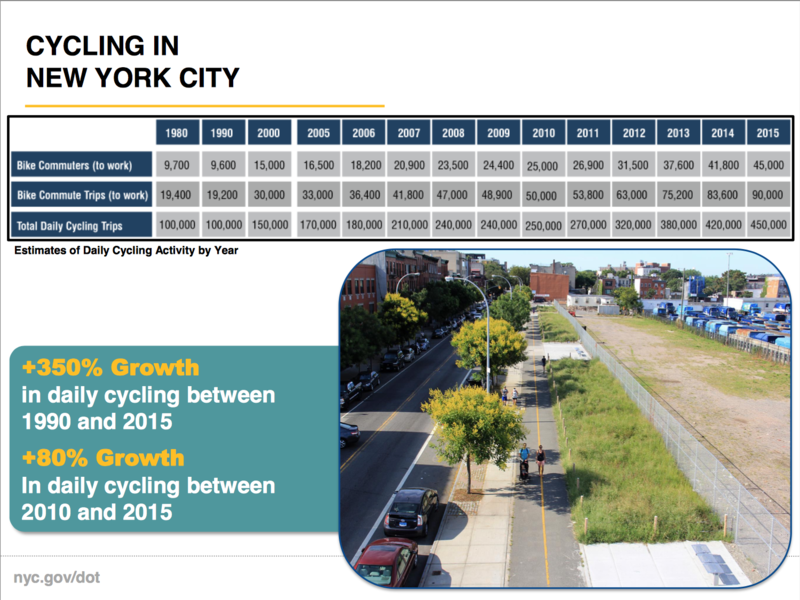 Data source: NYCDOT and PANYNJ. Measurements by Neile Weissman. Over the same period, bike trips across NYC overall grew 12.5%, driven by expansion of its bike grid and inauguration of bike share. At 521 users per hour, travel across the GWB paths well exceeds AASHTO‘s 300 user per hour threshold for widening to 14 foot. Remarkably, this level of use has been achieved on a facility with an FHWA level of service of “F – Failing“. Port Authority’s ADA-compliant plan Port Authority’s Plan: (1) 7′ path for peds-runners. (1) 7′ path for cyclists. 11′ high anti-suicide barrier. Rendering by Amman & Whitney. Replace stairs on the North Path with ramps. Restore paths across the one mile span to 7 foot, in compliance with ADA. Assign one path to pedestrians-runners and another to bicyclists. Unfortunately, PA’s plan won’t improve the GWB’s current “F” level of service. Peds-runners comprise just 25% of current peak use. 5-10% of pedestrians and runners will still use the bike path. Melt-refreeze of snow accumulation will continue to restrict winter access. 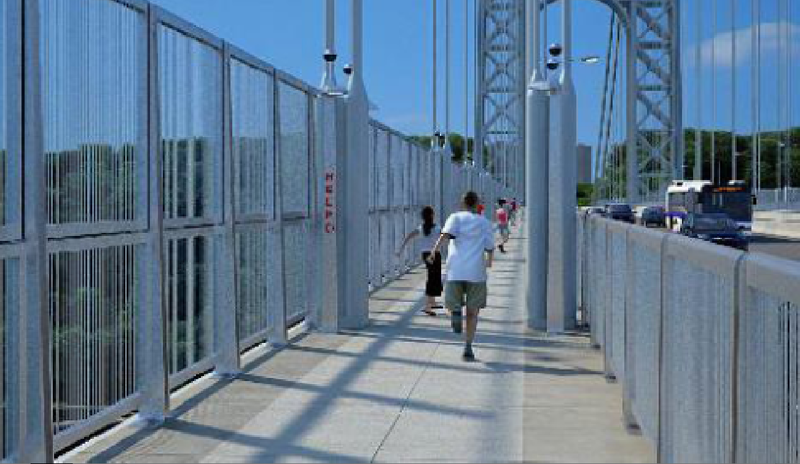 Safety barriers will obstruct views of NY-NJ waterfronts and Palisades. ADA won’t insulate the PA from liability in accidents involving cyclists. If current growth is sustained, the PA’s plan will remain “F – Failing”. Complete George’s AASHTO-compliant proposal Complete George: (2) 10′ paths for cyclists plus (2) 7′ paths for peds-runners. 9′ high anti-suicide barrier. Rendering by Joseph Lertola. 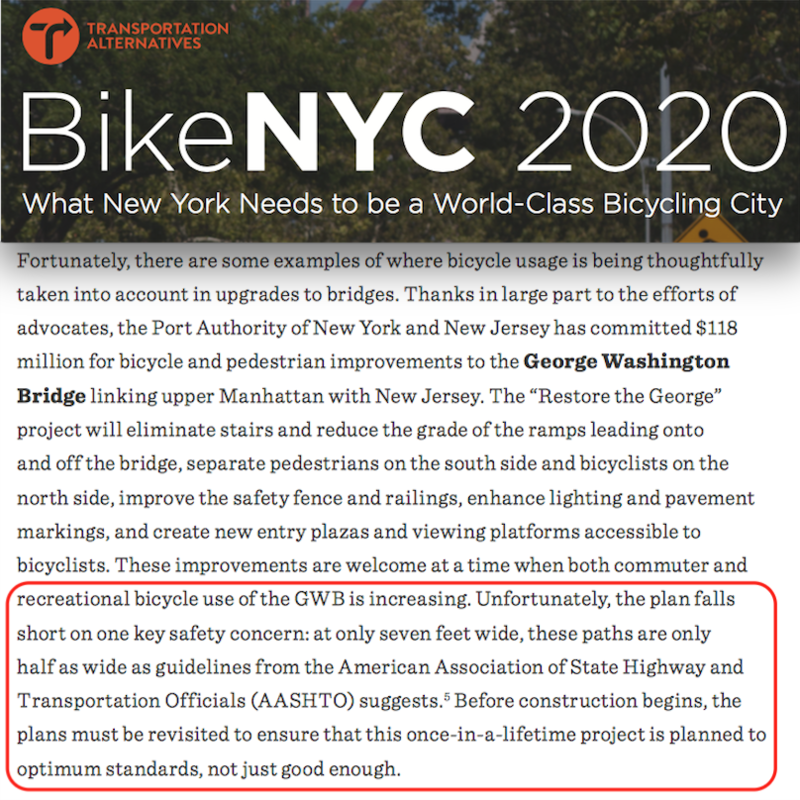 Complete George’s AASHTO-compliant proposal would cantilever a pair of 10 foot bikeways and connected anti-suicide barriers, below the sight lines of the existing 7 foot paths. These would remain in use for pedestrians and runners. This would result in four paths totaling 33.5 foot. It would maintain unobstructed views from the upper walkways. There are no cables intruding on the bikeways, which removes a significant safety hazard and allows for them to be fully snowplowed. Unlike ADA which makes no mention of cycling, AASHTO insulates the PA from liability arising from crashes involving bicyclists. The FHWA grade for this proposal will be “A – Excellent“. 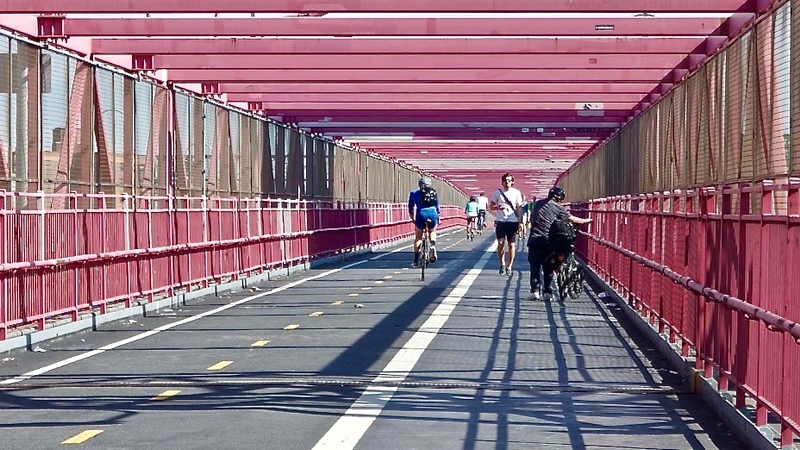 New York City has 828,000 adult cyclists and no recreational facilities not shared with pedestrians and represent a captive market for regional cycle tourism across North Jersey, the Mid-Hudson Valley, Long Island and Connecticut. Between the Mario M. Cuomo Bridge and the Empire State Trail, New York will invest $500 million to grow cycling across the region. 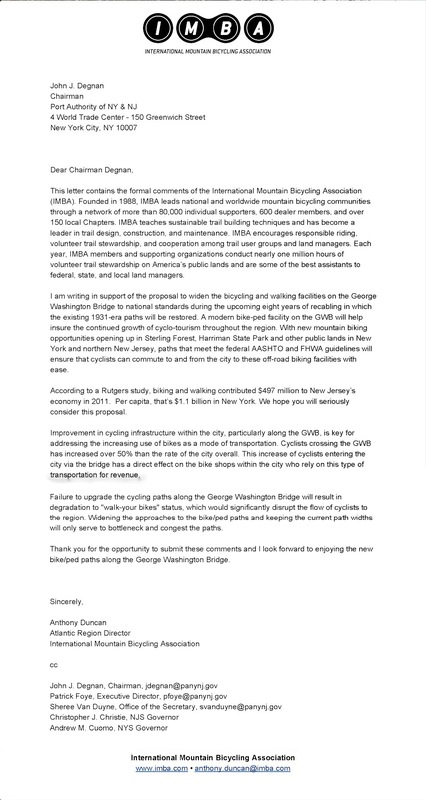 The GWB connects the two most heavily biked roads in the country, Hudson Greenway and Route 9W. With the completion of the Mario M. Cuomo, the GWB would form a forty mile loop drawing cyclists from across the region. 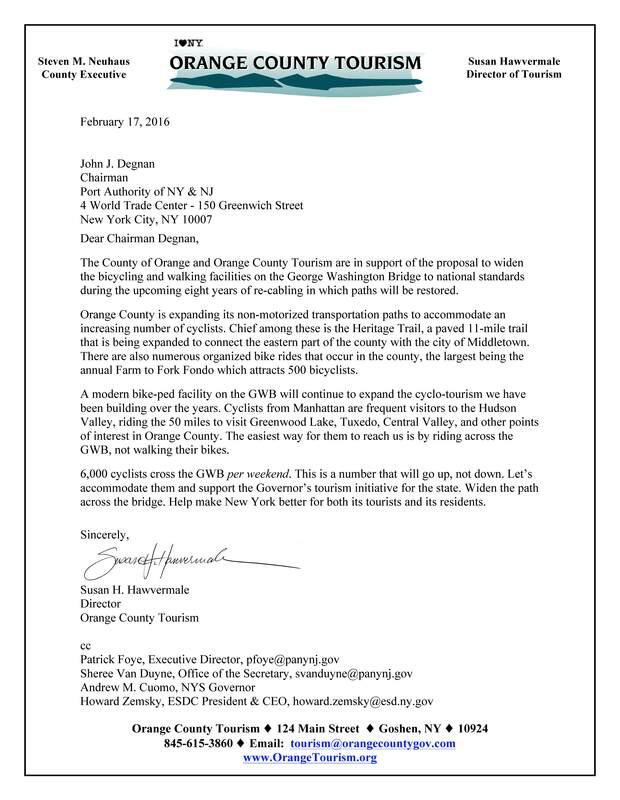 But cycle tourism could well decline if the single bikeable Hudson crossing out of NYC ceased to function as a cycling facility. 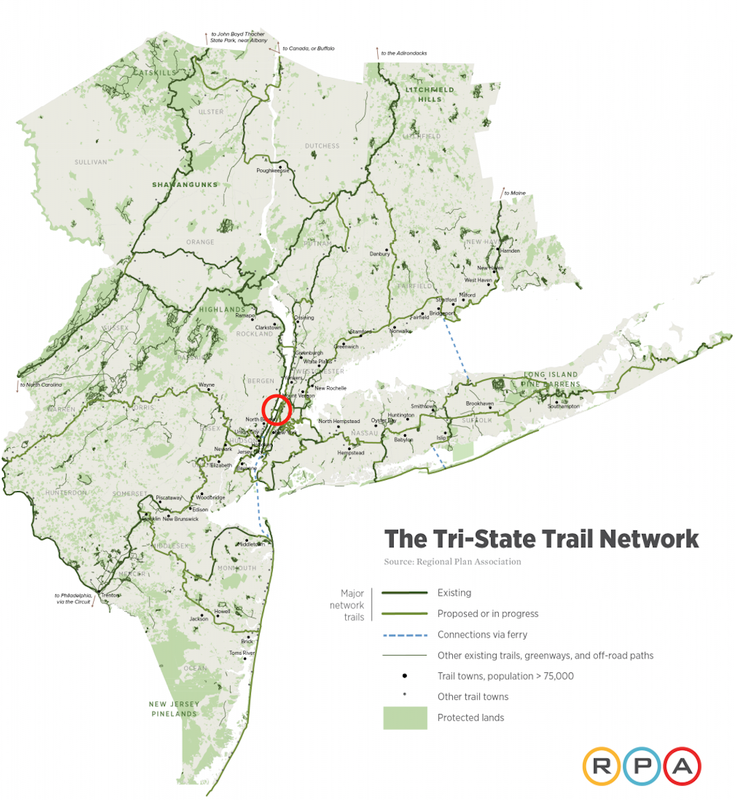 GWB is sole connector for 1650-mile trail network. Image Regional Plan Association. Employing models used to justify Walkway Over the Hudson, a linear park across the GWB, with unobstructed views of Manhattan and the Palisades, would annually attract 290,000 out-of-area visitors, spending $42 million and sustaining 675 jobs. 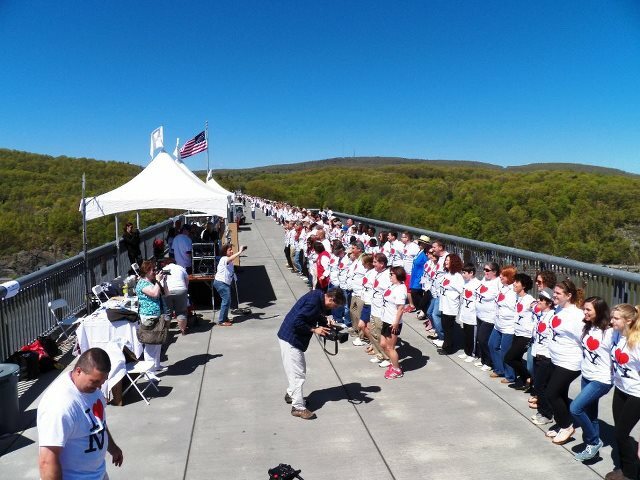 Walkway over the Hudson connecting Dutchess and Ulster Counties. Image WOTH. A World Health Organization model shows the increase in physical activity supported by wider GWB paths to reduce mortality by 21 deaths per years, annually saving $195 million. Doctors from the Columbia School of Public Health similarly determined wider paths would reduce morbidity at $883 per quality adjusted life year (“QALY”). That’s 14 times a more cost-effective public health intervention than vaccinating kids against the flu. If bike trips across the GWB were credited as the PA subsidizes trips by low-emission vehicles ($2.75-$6.75 per trip), the CO2 offsets would be worth $5.8 million per year. Widening bike paths to supporting the growth of sustainable modes of travel is the least expensive way to reduce greenhouse emissions from transportation, helping the PA, and the region, meet their “80 by 50” reduction goals. Organizations adapting to a “Two-Degree World” face three channels of risk: physical, liability and transitional. Investing in assets whose value would rise in a low carbon economy diversifies that risk. 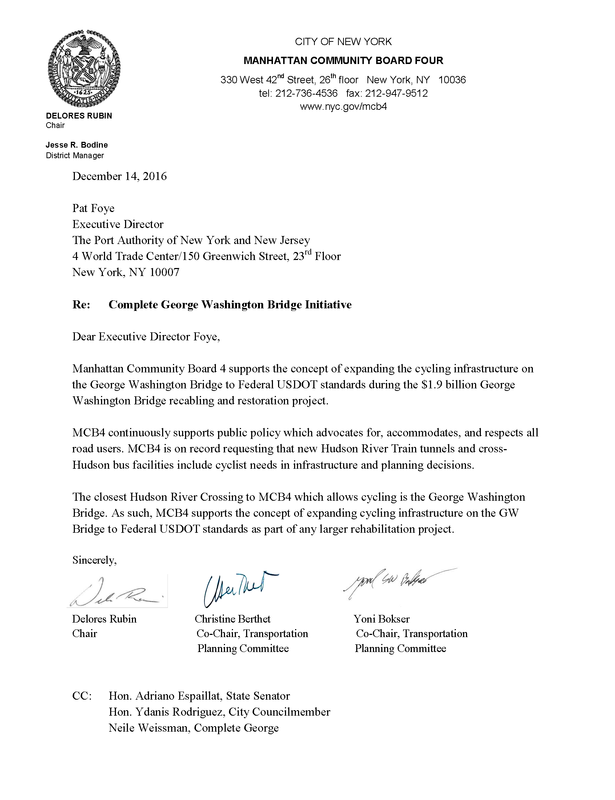 Cycling across the George represents a significant increase in trans-Hudson capacity, one that meets the PA’s criteria for as a means to reduce bus traffic into Manhattan. Should we lose the Hudson rail tunnels before replacement tunnels can be built, wider paths would support 20,000 bike commuters per day. If included in the ongoing restorations, significant new capacity would be online by 2021. Williamsburg Bridge. Image Bowery Boogie. Stakeholders in plans to Restore the George are working class, minority communities who’ve borne the brunt of bridge congestion, unsafe streets and degraded air quality for generations. If it widened the paths, the PA would align itself with cities like Baltimore, and Los Angeles which will spend $4 billion over 40 years to extend cycling infrastructure to its “transportation deserts.” The expansion of the San Franciso-Oakland Bay Bridge provides a critical waterway link where no other option exists. San Francisco-Oakland Bay Bridge, East Span, Caltrans. Source, W. Mueller II. 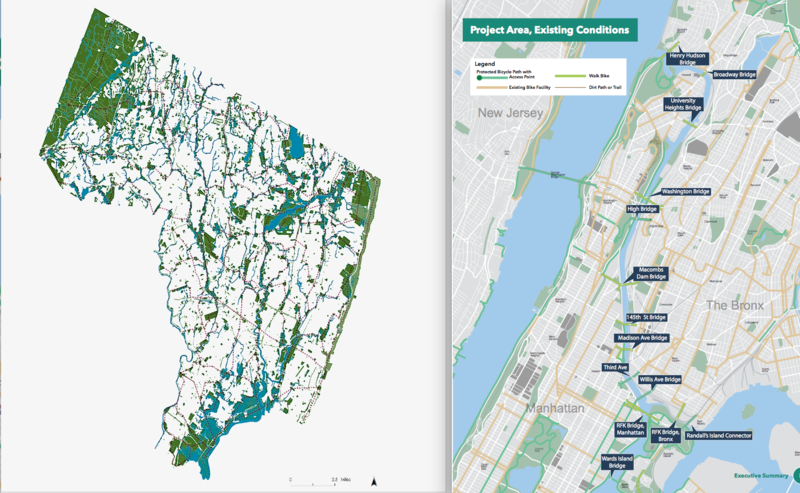 Bergen County and New York City are each moving forward on programs to dramatically expand cycling across the region on either side of the George. Unfortunately, they will further hasten it’s obsolescence as a cycling facility. Images Rutgers CUES and NYC DOT/AECOM. Cities across the U.S. market their cycling infrastructure to attract a millennial workforce. Fifteen Amazon finalists were ranked in the “Top 50 U.S. Cities to Bike.” Seattle was #3. New York City was #1. Newark was not ranked. London, ranked as the the #2 Most Competitive City worldwide (behind NYC), is in the midst of a $1.4 billion build-out of its bike grid. This year, they expect that 50% of all trips into their Central Business District will be by bike. Multiple studies correlate increases in home prices to their proximity to bikeways. These range from 4% in Delaware to 23% in Chicago. Crediting NYC’s thousand mile bike grid with a “Delaware” multiple, its current share of annual city property taxes would be $150 million. If adding a robust trans-Hudson connector to that grid enhances it value another half a percent, the incremental revenue would be $15 million per year. European Cyclists’ Federation credits cycling with saving the E.U. $27.7 billion per year in reduced noise, emissions, gas use and health costs or $546 per person. 90% of Tokyo‘s 13 million residents use mass transit for their daily commute. Of those, 30% bike the first-and-last mile. Portland, a city of 2 million, with a 6% bicycle mode share credits its bike grid with preventing $2.6 billion per year from leaving the city. Tilikum Crossing, Portland. (2) 14′ paths. Cost $135 million. Image Tedder. $380 million, or 20% of the total $1.9 billion resoration, is what USDOT recommends to upgrade bike-ped paths on bridges during renovations. 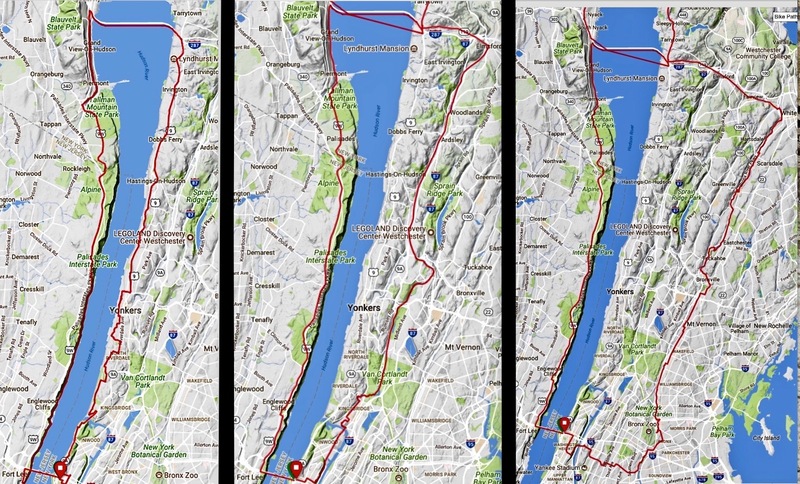 The GWB will need to support more bike trips than all the others combined. High Bridge – Getty. Goethals Bridge – PANYNJ. Bayonne Bridge – Ramlogue. Historically low interest rates allow the PA to finance construction cheaply and without affecting their credit rating. Cantilevers for bikeway can support safety scaffolding during recabling. Proceeding now saves decades’ worth of Construction Cost Index increases. Presuming 3% annual increase in the cost of construction, plus 2% inflation, the cost to widen the GWB paths grows from of $90 million in 2018 to $430 million in 2050. 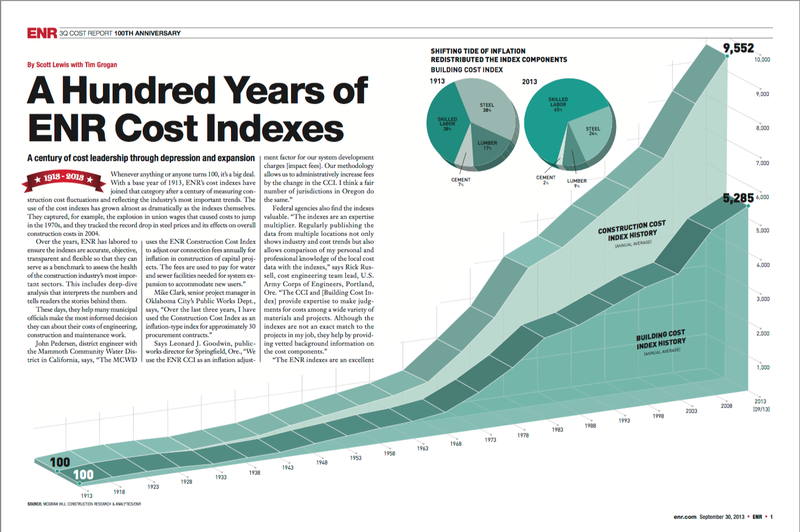 Construction Cost Index 1913-2013. Engineering News Record. 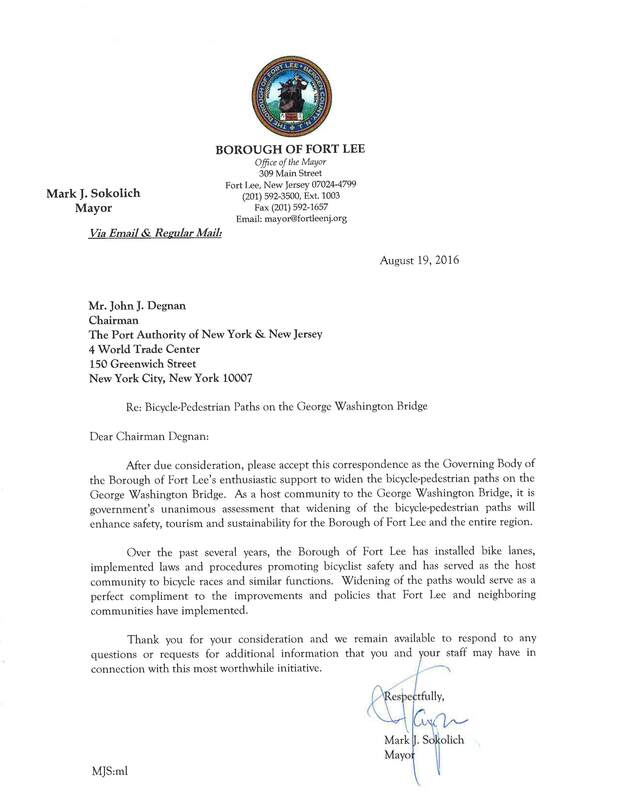 240 organizations, businesses, communities and public officials have called on the PA to widen the GWB paths to comply with national standards as part of the upcoming reconstruction. 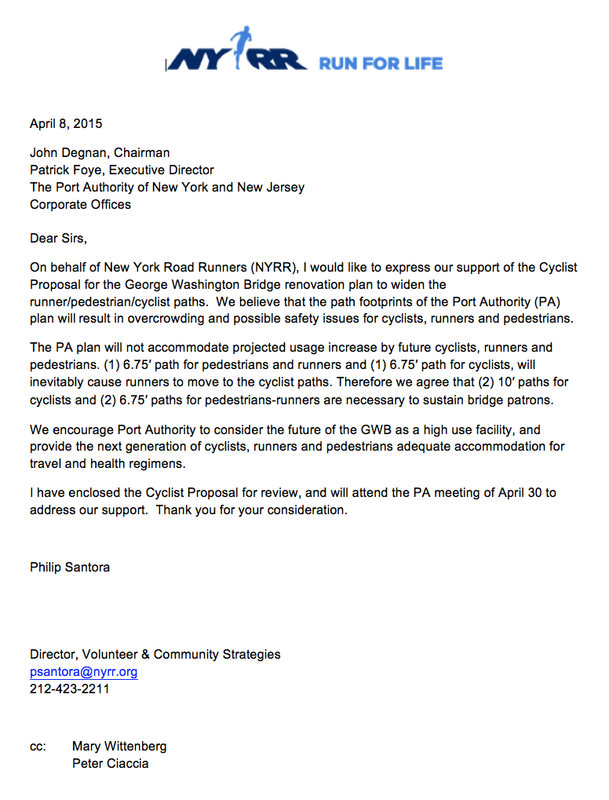 If a 3700 cyclists per day is insufficient to warrant widening the paths now, then what is the PA’s threshold? How much more crowded does it need to get? If the PA regards the cost of widening as too high during recabling, then what’s the likelihood that a standalone job, at far greater cost, will find acceptance later? How will bike share providers rebalance during periods of peak use if bicycles are allocated a single 7 foot path? CitiBike 12-unit transporter. Photo by Susan Brennan. If 240 organizations, businesses, communities and public officials aren’t enough of a constituency to get this project moving, then who is? How can the PA guarantee bicyclists continued access without the insulation from liability afforded by an AASHTO-compliant design. 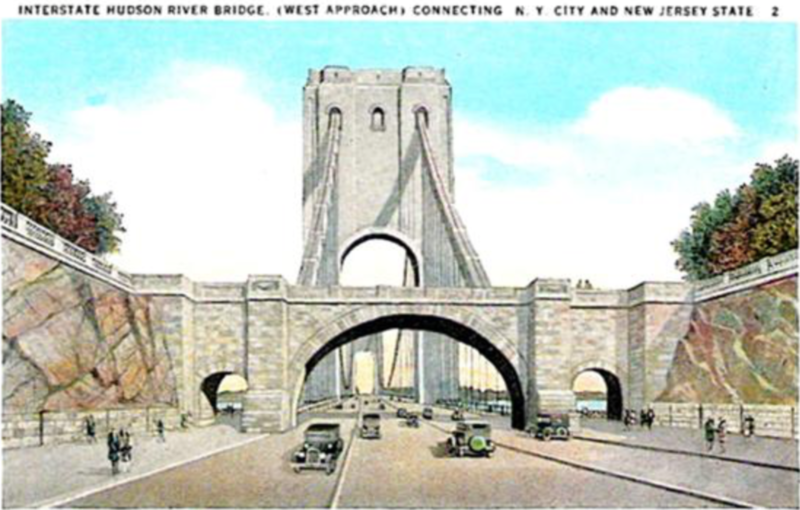 GWB architects Othmar Ammann and Cass Gilbert specified 16 foot wide paths in the original plans. Rendering of GWB entrance with 16 foot wide pedestrian portals. Image Cass Gilbert.